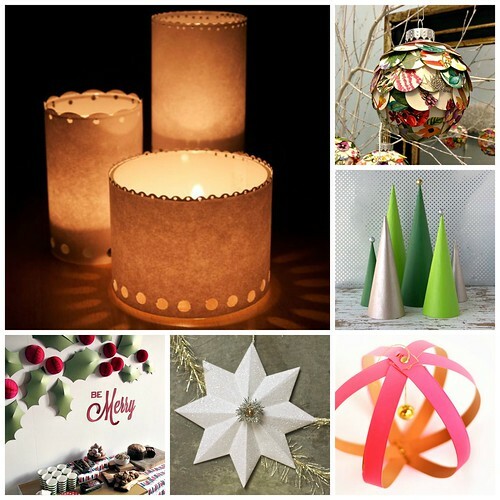 We're getting pretty close to the wire now, but if you still have a yen to make something pretty for Christmas, here are some of my all-time favorite decorating ideas that are quick to do, but make a big impact. 1. Candle luminaries are the easiest project from the All Things Paper book as shared on Kollabora. Designed by Kristen Magee, I love that the use of ordinary copy paper and hole punches can result in something so elegant. 2. While rummaging in the attic for tree decorations, don't throw away discolored balls. Just cover them with punched circles to make artichoke-style ornaments. Allison Patrick came up with this clever idea and used colorful flower images that look pretty year-round. 3. ConfettiPop shows how to turn dull paper mache cones into stylish, colorblocked decor with a little paint and glitter. 4. These simple paper strip ornaments are longtime favorites. Willowday makes hers extra special with the addition of a tiny bell. 5. A new-to-me blog is Urban Comfort. Suzonne Stirling designs projects for popular magazines and shares ideas via gorgeous photos and tutorials - these folded stars, for example. The holly and berries on the wall, bottom left, are just stunning! The candle luminaries look so beautiful and they can be used all-year round. I am definitely making them! What a lovely lot of ideas! Happy Christmas! I'm glad you all enjoyed the post! I love the holy wall.